According to the 2010 United States Census there were over 463,000 row homes in Philadelphia. Now, in a time where we understand the environmental and economic impacts of energy dependent buildings, we can see that the row home is not as efficient as it may seem. If Philadelphia’s attached housing continues to cycle through repetitions of similar designs, we cannot expect to gain more efficient results. Brewhub breaks free of the traditional attached housing design by flipping attached housing on its side. Brewhub does not continue to divide communities with rigid urban walls, but provides pedestrians with an increased freedom of movement. 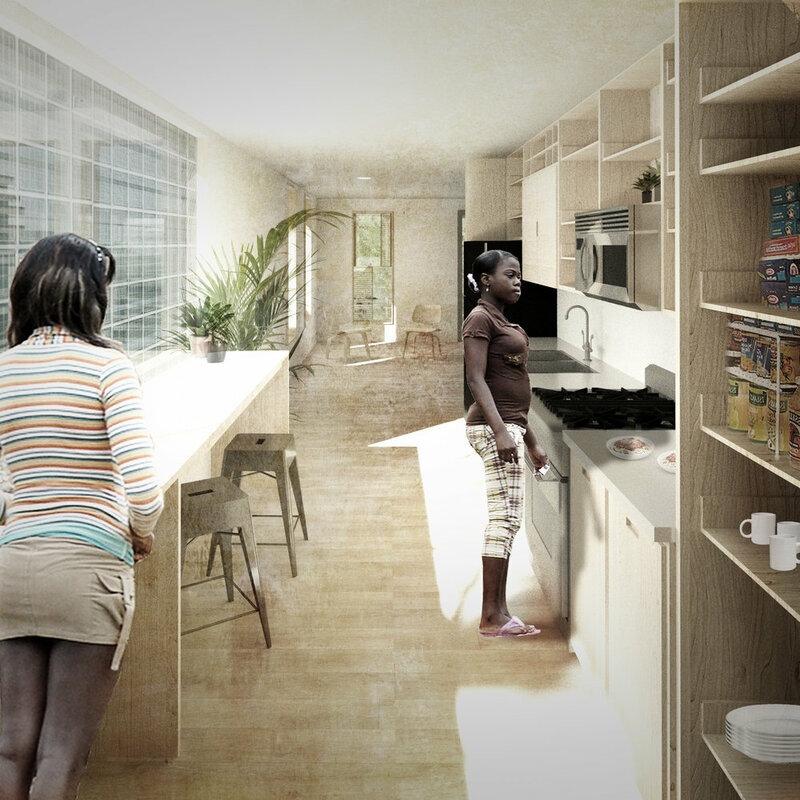 While shared walls make the row home more efficient, it also causes a lack of proper ventilation and natural lighting. The row home has attempted to improve ventilation and lighting with the addition of a “key” design (a small void cut into the back of the row home). Based on energy analysis, this attempted solution made the row home even less efficient by raising its kBTU from 38kBTU to 45kBTU per year. A series of Sefaira tests were run to analyze Brewhub’s design in comparison to a standard three-story Philadelphia row home. All tests were run with the same building square footage and window percentages. The results revealed that the standard row home’s lack of lighting and proper ventilation outweigh the efficiency of its insulated walls. Brewhub flips the row home on its side and creates vertically by stacking homes on top of each other rather than next to each other. From this action, there is the creation of a passive, multi-use stair tower. Proper envelope enclosure and the optimization of a site planning strategy that allows this alternative to outperform the typical attached housing scheme.